Feel good when you are eating it kinda food. These homemade granola bars were the first recipe I tried from April’s cookbook and if these are any indication as to how the rest of the recipes are going to be from this book then we are going to have a rockin’ month, I mean week. 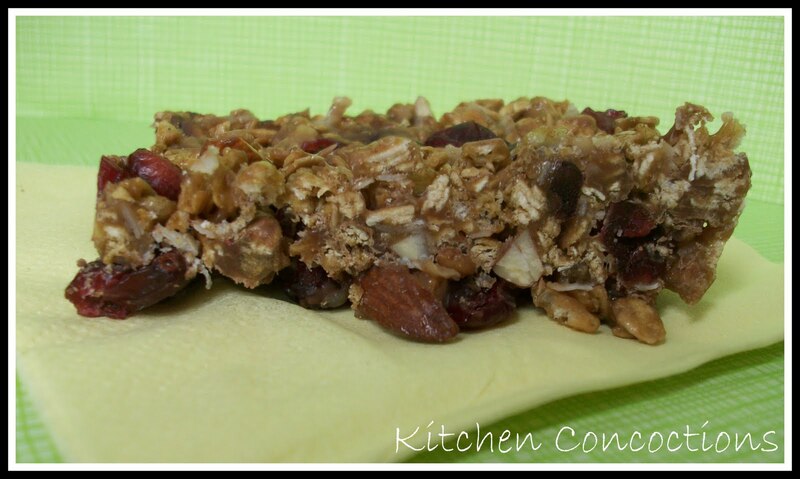 These granola bars came together fast and were not much effort at all. They tasted amazing (you really could taste a almond, or cranberry, or chocolate morsel in every bite). The coconut adds nice texture and flavor as well and with a hint of vanilla these are over the top. 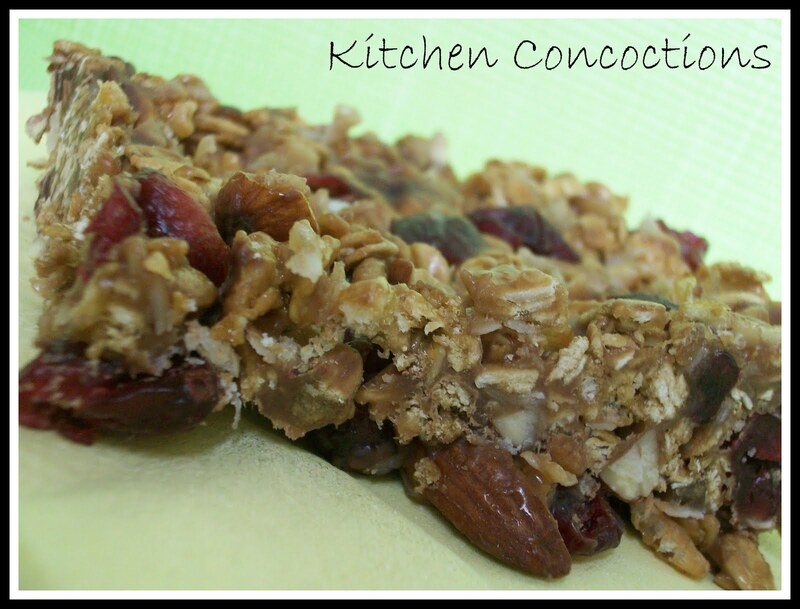 WAY better than ANY store bought granola bar I have ever had (a lot less expensive too) AND WAY healthier with LESS than 100 calories per bar (which TOTALLY makes me feel a lot better for eating about 1/3 of the pan myself in just the first day I made these). And don’t just take my word for it (although you should) but Eric didn’t stop raving about these and took several ‘bars’ to his family who also couldn’t stop raving about them! Combine brown sugar, honey, vanilla and butter in a medium-size saucepan. Bring to boil over medium heat. Lower heat; simmer 2 minutes or until sugar is dissolved. Cool. Meanwhile, combine granola, coconut, cranberries, chocolate, and almonds in a large bowl. Stir honey/sugar mixture into granola mixture. Spray a 9×13-inch pan with non-stick spray. Spread honey/granola mixture into prepared pan. Refrigerate for 2 hours or until cooled. Cut into bars. Those look so good. I will definitely have to make some… Soon!